Miggy is red-hot, with five home runs, 12 RBIs, and a .429/.485/1.071 line in his last seven games. It’s obviously come at a great time for the Tigers, who trail the White Sox by two games in the AL Central and are all but eliminated from wild-card contention (six games off with only 13 remaining). There’s no reason to think he won’t continue to rake against Twins pitching, and if it wasn’t for Mike Trout pulling a yearlong Mickey Mantle act, he’d be on the verge of collecting an undisputed AL MVP. 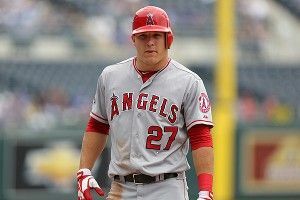 And as crazy as it seems, he could actually overtake Trout over the last week and a half. The key to that is the Triple Crown. Win it, and the voters can’t possibly choose Trout. Cabrera is currently leading in RBIs and average, and trails Josh Hamilton by one home run. Trout’s case is simple — his numbers are only slightly behind Cabrera’s (.324/.392/.551 vs. .333/.398/.613), but he’s stolen 46 bases and played an excellent center field. But if he loses, he’ll have only himself to blame; since August 24, he’s hit .238 and watched his average drop from .345 to .324. It’s a slow weekend for the Cy Young Race, with only one AL contender (Jered Weaver) and two NL contenders (R.A. Dickey and Gio Gonzalez) pitching. But let’s do a quick handicap anyway. In the AL, I’ve got Justin Verlander slightly ahead of both Felix Hernandez and David Price, with Chris Sale and Weaver still hanging around as long shots. Verlander has the most strikeouts of any contender (and is just one behind teammate Max Scherzer for tops in the AL) and goes deeper into the game than any starter in baseball. King Felix has a very similar résumé, but is just behind in almost every superficial and sabermetric category. Price’s 2.58 ERA leads the league and still has a chance at 20 wins. In the NL, Clayton Kershaw’s injury has narrowed the field down to Johnny Cueto, Gonzalez, and R.A. Dickey. Gio has the highest fWAR (Wins Above Replacement) and the lowest FIP (Fielding Independent Pitching) among the contenders, giving him the sabermetric edge, and he also has the best shot at 20 wins. On the other hand, he walks a lot of batters and throws a lot of pitches, meaning his innings total is lower. That hurts his strikeout totals, despite his impressive k/9 rate of 9.47, second in the NL behind his teammate Stephen Strasburg. Cueto has a lower ERA, gives up fewer walks, and goes deeper into games, while Dickey leads the league in strikeouts (or will, once he overtakes Kershaw in his next start), and has the most innings pitched and the lowest ERA. It’s impossibly close right now, but I give Dickey the very slight edge. Did you know that’s how the Dodgers got their nickname in Brooklyn? A “trolley dodger” was apparently a Manhattan dis for Brooklynites, since they had lots of trolleys and had to get out of the way. Unfortunately for the L.A. version of the team, the end of their schedule has been a series of speeding trolleys, and they haven’t dodged any of them. Series losses or splits against the Padres, Diamondbacks, Giants, Cardinals, and Nationals have marred their September, and it only gets more difficult from here. Six of the last 12 games come against the Reds and Giants, and they still trail St. Louis by three games for the wild card, with Milwaukee wedged between. Anything less than a series sweep against Cincinnati, and we’ll be collecting a bloody carcass by the trolley tracks. he’s got the fifth-best FIP in the NL. Which means that if you remove fielding and run support and anything Lee can’t control directly, he’s just a small step behind the Cy Young contenders. With an excellent finish, he could even end the year with a sub-3.00 ERA. This has to be one of the all-time best seasons with a record under .500, right? Hudson’s story is about to get interesting, too. He’s had a good year, with a 15-6 record and a 3.77 ERA. But anything more than “good” would be stretching it. Still, he’s the nominal ace of the Braves staff, and with a one-game wild-card playoff looming in two weeks, you have to think he’ll want to take the mound. But holy hell, have you guys seen what Kris Medlen has done since becoming a starter? No big deal; just an 8-0 record with a 0.76 ERA. That’s all. In reality, there’s no real choice here for Braves manager Fredi Gonzalez. He has to go with Medlen. But you have to wonder if that’s going to rub Hudson the wrong way. Stay tuned. You know how we talked about L.A.’s rough end-of-year schedule? Well, the Cardinals are in the midst of a nice little nine-game stretch involving the Astros and Cubs and nobody else. It’s helped them hold off the hard-charging Brewers and the medium-charging Dodgers, and it could carry them to the Wild Card. To be fair, they finish with the Nationals and Reds, but those teams may be trying to set their rotations in advance of the playoffs, and they may not be as fearsome as usual. Looking ahead to that potential Braves-Cardinals game, you’d expect St. Louis to throw Kyle Lohse, who leads in wins and ERA, against Medlen. It’s Chipper’s last series in Philadelphia. That’s pretty cool. And yet I have a nagging fear that somehow Phillies fans will embarrass themselves. Philadelphia fans are the worst. and maybe the winner, too. The gem of this Milwaukee-Washington series is Wily Peralta against Gonzalez on Saturday. I don’t know how to pronounce Mr. Peralta’s first name, and I have to assume you say it like “Willy,” but I’m choosing to call him Wily with the hard “i.” I wish my name was Wily. The only downside of Wily is that people might associate you with Wile E. Coyote, who, let’s face it, was a buffoon. Anyway, Wily has done well for the Brewers since being called up in early September to replace Mark Rogers in the rotation, throwing 20 innings and allowing just four earned runs. He’ll try to keep the Brewers on their hot streak and keep Gio from becoming MLB’s first 20-game winner. Milwaukee has now won five in a row and posted a 14-4 mark in September, but the schedule stays tough with six games against the Nationals and Reds. As for the Nats, they’ll be keen to sew up the division before easing up on the gas pedal, guaranteed playoff berth be damned. Both Los Angeles teams are in the same position, where a series loss this weekend probably means the end of their playoff hopes. The good news for the Angels is that they dodge Chris Sale, and if they can manage to take two of three or sweep, Seattle awaits in six of the last nine games. But the White Sox obviously can’t afford to lose, either, and they have to go in expecting that the Tigers will make quick work of the Twins. With a difficult four-game set coming up against Tampa Bay, anything less than a two-game edge over their rivals after this weekend will put them at a huge disadvantage. Why? Because the Tigers’ last 13 games are all against the Royals and Twins. Even with a two-game lead coming into tonight, the White Sox have to be seen as the underdogs in the Central. It might not look like it on paper, but this series is a must-win for the White Sox, too.